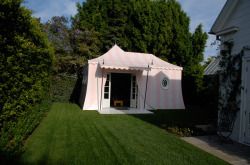 Bel Air Tent Pavilion - Curtis & Windham Inc. Situated on a lush lawn, surrounded by mature hedges, this tent pavilion welcomes visitors with its cheerful, striped metal-skin exterior and wide folding French doors. This is the third of three metal-skinned tent structures we designed. Others include the pool tent cabana at the Inverness Residence, which houses changing rooms and shades an open-air lounging area, and the tent pavilion at the Del Monte Residence, which shades a poolside sitting area.